Lawnmower maintenance is important to extend the life of your push mower or lawn tractor, and one of the most critical engine maintenance items is regular Synthetic Oil Change. For the best lawnmower engine performance, you should change oil after the first 5 hours of use for a new mower, then at least once every spring or summer mowing season or every 50 hours of operation, whichever comes first. Follow these steps to change your lawnmower engine oil in Dickinson. AMSOIL has all the 100% Synthetic Oil you need to change the oil in your lawn tractor or push mower. To make it even easier, use oil extractor tools to help avoid oil spills or work with inconveniently placed drain plugs. These types of tools also come with an oil-safe storage container. Bring your old oil to your local mechanic for oil recycling drop-off. If you have a larger riding mower or lawn tractor, use a jack to lift and secure your mower so you can easily change the oil, sharpen mower blades, replace belts or remove debris. If you have a push mower, begin by propping the mower deck up so that the spark plug is facing up. Then follow these steps for a DIY Synthetic Oil Change in Dickinson. Never dump used oil on the ground or down the drain. Take your used oil back to your local mechanic or a designated oil recycling facility to be properly disposed of. Oil filters in mowers help keep the oil clear of large particles of dirt and other debris. If your lawnmower is equipped with an oil filter, it is a good idea to change the oil filter at least once per year, or as often as is recommended by the manufacturer. Check your owner's manual to ensure you are using the best AMSOIL oil filter and for help finding the right replacement unit for your lawn mower's make and model. Look at the seal on the oil filter. If there is dirt or other debris on the seal (in our around the rubber gasket of the mower oil filter), clean it off. Now it is time to put new synthetic oil back into your lawnmower. For help determining which Synthetic Oil your small engines require, check your engine owner's manual and contact the pros at Advanced Filtration Technologies, Inc. Clean oil should appear translucent with a slight golden brown tint. Dirty oil will appear opaque and dark brown or black in color. Consider using an oil funnel to help prevent spills. 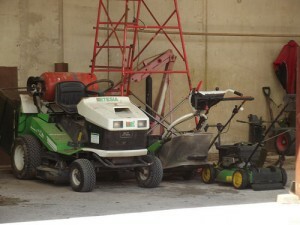 Once all of your new oil is inside the lawnmower engine, replace the oil fill plug or dipstick. Wipe the dipstick clean before inserting it back into the dip stick shaft. Finally, pull the dipstick back out of the mower and make sure the oil level is correct. The proper oil level marker can be seen on the dip stick. Put the dipstick back into the dip stick shaft and wipe away any excess oil that may have dripped or spilled onto other parts of the lawnmower. Advanced Filtration Technologies, Inc. offers a complete line of AMSOIL The First in Synthetics 100% Synthetic Oils and lubricants for all your engine needs. Contact us or call 701-572-3780 today to find out which AMSOIL Synthetic Oil your engines need in Dickinson.